practical examples you can use as inspiration for your lessons. • Helps you plan and deliver lessons with ideas and practical examples in the context of Geography. • Contains ideas for classroom activities, differentiation, active learning, reflective practice and formative assessment. • Practical lesson ideas are available from our supporting website to save you planning time [cambridge.org/9781316640623]. Approaches to learning and teaching Modern Foreign Languages is part of a unique series, written in collaboration with Cambridge Assessment International Education. The book gives examples, based on experience and observations of what works well, to help you put teaching theory into practice. It provides ideal support for Modern Foreign Languages teachers as well as those studying professional development qualifications or PGCEs. Practical lesson ideas are available from our supporting website to save you planning time. (cambridge.org/9781108438483). Simon Armitage Approaches to learning and teaching Geography is part of a unique series, written in collaboration with Cambridge International Examinations. Tried and tested pedagogy from global teaching workshops underpins the research in the book, making it ideal support for Geography teachers as well as those studying professional development qualifications or international PGCEs. Considering the local and global contexts when planning and teaching an international syllabus, this book presents ideas for Geography with practical examples you can use as inspiration for your lessons. Approaches to learning and teaching Geography is part of a unique series, written in collaboration with Cambridge International Examinations. Tried and tested pedagogy from global teaching workshops underpins the research in the book, making it ideal support for Geography teachers as well as those studying professional development qualifications or international PGCEs. Cambridge IGCSE® English Language Coursebook, Third edition with CD-ROM is tailored to the latest Cambridge IGCSE English Language syllabus (0610) and endorsed for full syllabus coverage by Cambridge International Examinations. Cambridge IGCSE® English Language Coursebook, Third edition with CD-ROM is tailored to the latest Cambridge IGCSE English Language syllabus (0610) and endorsed for full syllabus coverage by Cambridge International Examinations. Cambridge IGCSE® English Language Coursebook, Third edition with CD-ROM is tailored to the latest Cambridge IGCSE English Language syllabus (0610) and endorsed for full syllabus coverage by Cambridge International Examinations. Cambridge IGCSE® English Language Coursebook, Third edition with CD-ROM is tailored to the latest Cambridge IGCSE English Language syllabus (0610) and endorsed for full syllabus coverage by Cambridge International Examinations. Our Purpose Brighter Thinking drives the Cambridge Approach. Every day we talk to teachers and leading educational thinkers in Cambridge and around the world about how to make teaching and learning better. We share teachers’ ambitions to prepare students for success in life, both academically and personally. This rich insight and our common goal informs the development of every new educational resource we publish. It makes Better Learning possible, enabling students to accelerate their learning and develop skills for life. Tools to fuel the independent thinker More than 4,750 schools around the world teach International BaccalaureateÂŽ (IB) programmes, with academic rigour and emphasis on studentsâ&#x20AC;&#x2122; personal development at the heart of their teaching. Similar to our own ethos, IB programmes promote learning and responsibilities that go beyond academic success. Our resources encourage learners to explore the world around them through concepts, ideas and topics on a local and global level. In addition, they help students apply critical thinking and form reasoned answers in preparation for higher education and beyond. 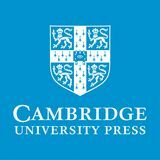 Cambridge University Press works with experienced and renowned authors to provide learning materials for all IB groups. Our resources advance the IB vision, providing globally aware, high quality and interesting materials for inquisitive minds. Thank you. All around the world teachers do fantastic work. Everyone has a story about a teacher who has inspired them, and gone out of their way to make a difference to their lives. As our way of saying thank you, we’ll be showcasing winning stories and expressing our appreciation by dedicating new books to the world’s most dedicated teachers. We support students at every stage of their academic life, helping to prepare them for the world of tomorrow. We publish for specific syllabuses, but many of our resources are adaptable to suit your needs. Below is a comprehensive map of our education publishing, so you can plot materials appropriate for the age of your class. International ® Baccalaureate (IB) Diploma More than 4,000 schools teach International Baccalaureate® (IB) programmes, developing inquisitive and knowledgeable learners around the world. 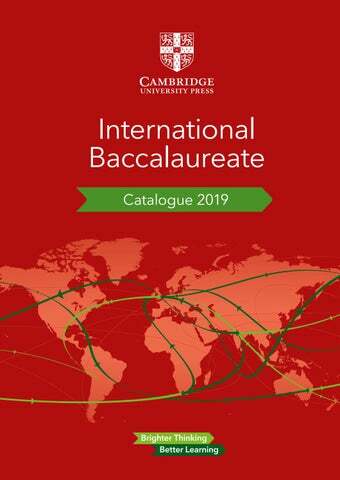 Cambridge University Press works with experienced and renowned authors to provide learning materials for all six IB groups. This manual is an invaluable resource for schools already offering the IB Diploma, as well as for prospective Diploma schools. This best-selling series has been fully revised and updated for the new syllabus for first examination from 2021.
mbridge perienced extbooks ge Teachers wide. This spread is from English B for the IB Diploma Authentic global material which is appropriate for teenagers – includes topics like science, health and beauty. Theory of Knowledge questions prompt class discussion and debate. Uses real-life examples for discussion derived from a range of sources including advertising, annotated and deconstructed texts, the media, blogs and the internet. Word bank feature boxes provide guidance for second language learners. Second editions These new editions support the IB Diploma Language B guide for examination from 2020. As students explore thought-provoking materials within the themes and topics of the new guide, they develop wellrounded language skills and solid critical thinking, helping them succeed in their examination and unlock opportunities in the real world. nolds has ma Visual years and at the hool is a and r and is of the Visual nThinking et/visualarts), ducational vice. Visual Arts for the IB Diploma is tailored to the IB subject guide for first examination in 2016. This coursebook covers each of the core areas of the Visual Arts course and links them to theoretical, art-making and curatorial practices. It includes activities that provide students with practical ways to learn and reflect on their work. Written by an experienced teacher and examiner, students can feel confident that this book will help them navigate the course requirements. This book supports and encourages learners on their individual journey of inquiry, investigation, reflection and creative application in art. Heather McReynolds has taught IB Diploma Visual Arts for over 20 years and was Head of Art at the International School of Florence. She is a practicing artist and workshop leader and is also the author of the Visual Arts pages on InThinking (www.thinkib.net/visualarts), an innovative educational consultancy service. ather McReynolds has ght IB Diploma Visual s for over 20 years and s Head of Art at the ernational School Florence. She is a cticing artist and rkshop leader and is o the author of the Visual s pages on InThinking ww.thinkib.net/visualarts), innovative educational nsultancy service. All language skills covered to provide well-rounded linguistic development. A Deutsches Essen ist sehr vielfältig. In diesem Artikel lesen Sie nun mehr darüber, was verschiedene Deutsche zum Thema Essen in ihrem Land denken und sagen. B Essgewohnheiten werden dem Lebensstil angepasst. C Ausländische Einf lüsse haben die deutsche Küche bereichert. D Internationale Gerichte werden abgelehnt. E Herzhafte traditionelle Gerichte werden bevorzugt. WAS IST TYPISCH DEUTSCHES ESSEN? Der deutschen Küche hängt schon seit langer Zeit der Ruf an, besonders schwer im Magen zu liegen. Was ist denn nun eigentlich heutzutage typisch deutsches Essen? Dreht sich alles nur um die Wurst? Oder etwa nicht? Wir haben verschiedene Personen aus Deutschland zu diesem Thema befragt. F Es gibt weitere deutsche kulinarische Bräuche jenseits von Fleisch und Würsten. Marianne und Oskar: Dazu gehören für uns als Brandenburger deftiger Eintopf und verschiedene Kartoffelgerichte. Fleisch, Würste und Sauerkraut sind hierzulande ungemein beliebt, aber auch der internationalen Küche, zum Beispiel der italienischen, sind die Deutschen nicht abgeneigt. Thomas: Das deutsche Essen ist auf keinen Fall einheitlich, sondern in jeder Region anders. Im Norden isst man wegen der geografischen Lage viele Fischgerichte, aber im Süden, vor allem in Bayern, wo ich lebe, kommt man an Weißwurst und Schweinshaxe nicht vorbei. Am besten schmeckt es heruntergespült mit Bier. Angela: Ich liebe besonders die deutsche Tradition von Kaffee und Kuchen. Am Nachmittag essen wir leckere Kuchen wie Streuselkuchen, Bienenstich, Käsekuchen, die frisch vom Bäcker kommen, mit einer Tasse Kaffee oder Kakao. Manchmal gehe ich auch in schicke Konditoreien, wo es köstliche Sahnetorten und Feingebäck gibt und man nach Herzenslust schlemmen kann. Authentic texts engage students with the target language cultures. An Ihrer Schule gibt es mehrere Schüler aus Deutschland. Verfassen Sie für die nächste Ausgabe ein Interview mit Ihren deutschen Freunden über typisch deutsches Essen. Sie könnten u. a. die folgenden Fragen stellen: Was essen die Deutschen wirklich? Warum? Inwiefern stimmen die Klischees von Wurst und Bier? Welche Gerichte sind in bestimmten Regionen Deutschlands beliebt? Benutzen Sie die Checkliste für ein Interview aus Kapitel 6. Sie sollten für SL 250–400 Wörter und für HL 450–600 Wörter schreiben. Johannes: Das Klischee von Kartoffeln und Würsten ist doch längst überholt. Deutschland ist ein Multikulti-Land und so sieht’s auch beim Essen aus. Typisch deutsch ist deshalb für mich der Döner Kebab, den es an jeder Straßenecke gibt, denn die türkische Küche ist aus der deutschen gar nicht mehr wegzudenken. Links to the workbook for easy reference and extra practice. Activities in the style of the exam help students practise throughout the course. CAS, TOK and EE integrated into the activities to establish links with the IB Core. TIPP FÜR DIE PRÜFUNG Verwenden Sie umgangssprachliche Redewendungen, um authentischer zu klingen und eine bessere Note zu bekommen. Vergessen Sie nicht, dass Sie in der Prüfung mit Paper 2 zeigen müssen, wie gut Sie die deutsche Sprache beherrschen – dazu gehören ein umfangreiches Vokabular, komplexe Satzstrukturen und eben auch Umgangssprache. Exam tips to help students succeed in their examination. Felix: Currywurst mit Pommes, definitiv. Gerade hier in Berlin hat die Wurst Kultstatus. Ich bin oft unterwegs, deswegen esse ich alles, was schnell geht: Burger, Pizza, belegte Brote, Frikadellen und Hähnchen. This new edition supports the IB Diploma Language ab initio guide for first examination from 2020. Panorama francophone is currently the only resource available specifically designed to guide students through the ab initio French course for the International Baccalaureate programme. History for the IB Diploma Papers 1 and 2 Second edition Series Editor: Allan Todd IB Diploma History syllabus for examination from 2017. • The titles are source-led and encourage the development of investigative, interpretive and analytical skills, which help your learners become independent thinkers • Relevant links to Theory of Knowledge and Key Concepts in the syllabus encourage reflective discussion and help students integrate these concepts into their wider learning • Activities foster an exploratory and inquiring approach and exam-style questions help prepare students for assessment • The series covers topics from the Standard and Higher Level options Paper 1: History for the IB Diploma, Paper 1 includes a choice from three coursebooks that each cover a 20th century topic from the syllabus: The Move to Global War (Japanese and German/Italian expansion), Rights and Protest (US Civil Rights and Apartheid) and Conflict and Intervention (Rwanda and Kosovo). Paper 2: History for the IB Diploma, Paper 2 includes a choice from five coursebooks that each cover a 20th century topic from the syllabus: Independence Movements (1800–2000), Evolution and Development of Democratic States (1848–2000), Authoritarian States (20th Century), Causes and Effects of 20th Century Wars and The Cold War: Superpower Tensions and Rivalries. History for the IB Diploma Paper 3 Series Editor: Allan Todd IB Diploma History syllabus for examination from 2017. IB Diploma Business Management syllabus for examination from 2016. IB Diploma Economics syllabus for examination from 2013. Help your students think critically, make ethically sound decisions and think strategically with Business Management for the IB Diploma. This economics course helps students develop international perspectives, and foster a concern for global issues. It raises students’ awareness of their own responsibilities at a local, national and international level. Would you like help with revision for your class? THESE RESOURCES ARE ALIGNED TO THE IB MATHEMATICS DIPLOMA FOR FIRST TEACH FROM 2012. Visual Arts for the IB Diploma Heather McReynolds IB Diploma Visual Arts syllabus for examination from 2016. Cambridge School Shakespeare helps you deliver an active approach to classroom Shakespeare, enabling students to inhabit Shakespeare’s imaginative world in accessible and creative ways. Chaucer Audio CDs Get your class to experience authentic Middle English! Read in the original language of Chaucer’s time, these CDs help students understand the texts. Use them with Cambridge School Chaucer or the Selected Tales from Chaucer. We know why probability is important – first, it is an intrinsic part of mathematics, with attractive methods to solve challenging abstract problems. But perhaps more important is its relevance to the real world, as it provides the formal framework for dealing with chance, randomness and uncertainty in general. Statistics has developed in parallel with the advances of technological and social change. This book frames the interconnectedness of the subject around the experiences that students should have, rather than the specific techniques required. These subject-specific guides provide teachers with a range of practical ideas, from classroom activities to differentiation, active learning, reflective practice and formative assessment. They’re ideal if you are studying a professional development qualification or international PGCE. The Approaches to learning and teaching series considers the local and global contexts when planning and delivering a syllabus. It has been written in collaboration with the world's largest provider of international education programmes and qualifications for 5 to 19 year olds, Cambridge Assessment International Education. The titles present ideas in the context of subject and give practical examples that help you put theory into context. In addition, with each title you get a variety of lesson ideas you can download from our website. The book considers the local and global contexts when planning for and teaching a syllabus and presents practical ideas and tips you can use as inspiration for your Art & Design lessons. Modern Foreign Languages Paul Ellis and Lauren Harris Approaches to learning and teaching Modern Foreign Languages is part of a unique series, written in collaboration with Cambridge Assessment International Education. The book gives examples, based on experience and observations of what works well, to help you put teaching theory into practice. It provides ideal support for Modern Foreign Languages teachers as well as those studying professional development qualifications or PGCEs. The book considers the local and global contexts when planning for and teaching a syllabus and presents practical ideas and tips you can use as inspiration for your Modern Foreign Languages lessons. Modern Foreign Languages Considering the local and global contexts when planning and teaching an international syllabus, this book presents ideas for Geography with practical examples you can use as inspiration for your lessons. Approaches to inlearning underpins the research the book, makingand it ideal teaching support for Geography teachers as well as those studying professional development qualifications or international PGCEs. Literature in English Considering the local and global contexts when planning and teaching an international syllabus, this book presents ideas for Geography with practical examples you can use as inspiration for your lessons. Approaches to learning and teaching Art & Design is part of a unique series, written in collaboration with Cambridge Assessment International Education. The book gives examples, based on experience and observations of what works well, to help you put teaching theory into practice. It provides ideal support for Art & Design teachers as well as those studying professional development qualifications or PGCEs. Goodbye CD-ROM, hello digital teacher’s resources To ensure our teacher's resources are as helpful as possible and enhance teaching and learning, our Cambridge Elevate editions are available as print and digital bundles, or standalone digital editions. • Your digital teacher’s resource gives you access to everything you need to plan your teaching. Choose from editable Word files or PDFs for lesson plans and worksheets, and download supporting files from within the resource. • Go directly to the resource index to download every file you need to deliver a specific unit or lesson, so you don’t have to rely on your internet connection. • Cambridge Elevate is simple to navigate and personalise – highlight text, annotate, create voice notes, or organise your table of contents. • Access your library of Cambridge books anywhere, anytime, whether online or offline (via the app). Details of your local branch and/or representative are listed in the following pages. Create your shopping basket at cambridge.org/ education and place your order. Please register to use your credit card. Place a firm order or request a sample Contact your local representative. Europe For general enquiries for Europe, contact Michelle Cresswell mxcresswell@cambridge.org Alternatively contact your local agent. Alternatively contact your local agent.